It's Independence Day, and just like you (we hope) our workroom staff are off to the park for a picnic! Chrissa thinks this spot looks perfect — which is good, 'cause she can't carry those sodas one step further! Chrissa's casual striped top is really a swimsuit made using Lee & Pearl Pattern #1051: Ballet Basics Leotard & Unitard for 18" Dolls with BONUS Swimsuit Pattern. Her coordinating red shorts are made using Lee & Pearl Pattern #1033: Bonjour, Paris Mini Wardrobe for 18" Dolls, and her trucker hat comes from Lee & Pearl Pattern #1008: Classic Ball Cap and Big Fat Trucker Hat for 18" Dolls. The "ice" keeping Chrissa's Christmas ornament six pack of Cokes cold is really rock candy. And that awesome mini galvanized washtub? We found ours at Goodwill, but here's the identical tub from Factory Direct Craft. "Don't be so dramatic," says Kit, resplendent in her sunny yellow wrap dress from Lee & Pearl Pattern #1031: Classic Wrap Dress and Peplum Top for 18" Dolls and her gingham apron and diamond-stitched oven mitt from Lee & Pearl Pattern #1022: Cookie Time Apron, Pinafore and Oven Mitt for 18" Dolls. "I've already set up everything else. 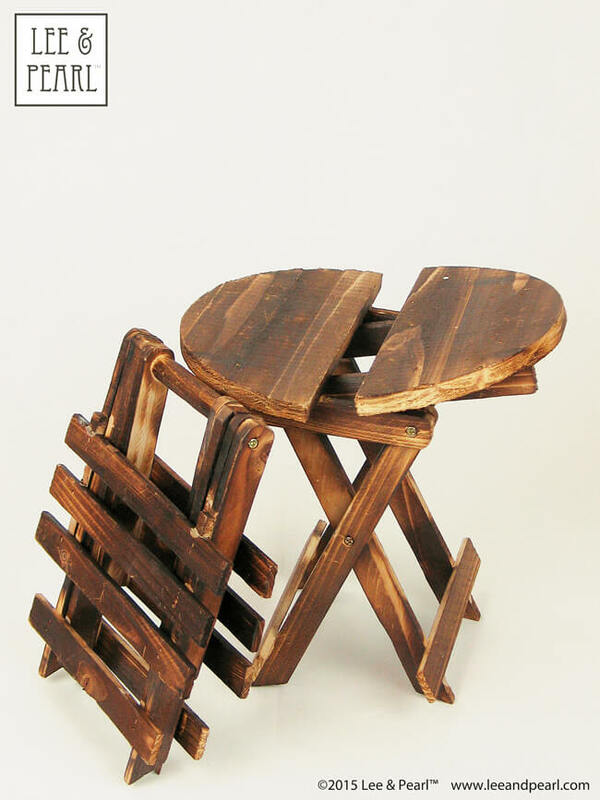 Look, we've got these great tables..."
Kit's picnic tables are easy-folding plant stands from Japanese dollar store Daiso. When looking for doll props and furniture, we always recommend checking the nursery and floral decor sections of your craft, home goods or discount store for nicely scaled, unique items like these! "... and just look at this incredible new stove!" 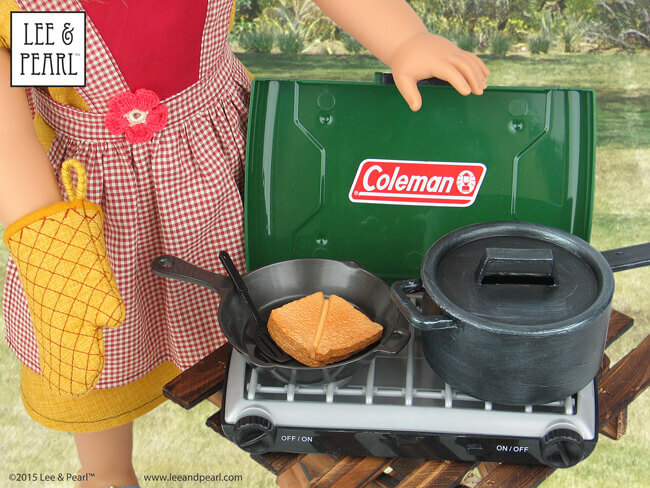 We agree with Kit: we've loved this ultra-realistic green Coleman® camp stove from Sophia's since we first saw it at Toy Fair. The burners even light up, though you might have to wait for the evening marshmallows to properly appreciate their warm glow. This stove comes with plenty of food and a nifty saucepan, but we thought it needed a matching cast iron pot for chili or baked beans — so we made one! Our new pot (on the right) started out as a cheap-looking dollar store toy. But you'd never know after our realistic "cast iron" paint job. 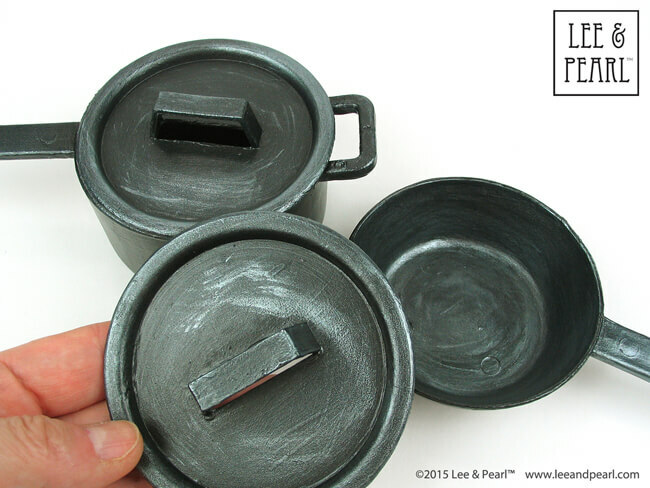 Click HERE for the "cast iron" plastic painting tutorial. 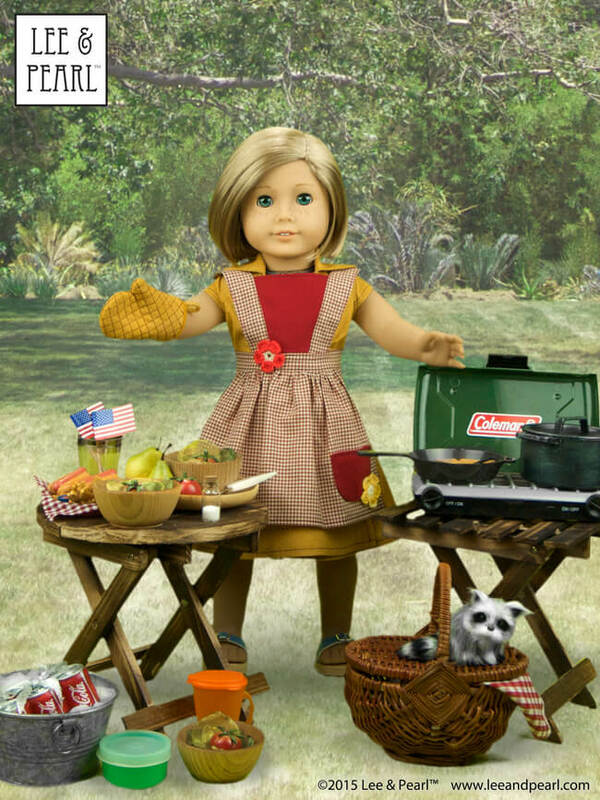 Kit has been busy preparing the picnic food. Her platter of hot dogs started out as a Christmas ornament; the tiny pears came from the Michael's craft store floral department; and the tiny glass salt jar came from the Michael's scrapbooking aisle. We made the polymer clay tomatoes ourselves, starting with the directions in this YouTube tutorial. We made our tomatoes bigger, mottled the leaf color by mixing two colors of clay, and dusted the tomato tops with yellow and bright green pastel chalk for even more realism. 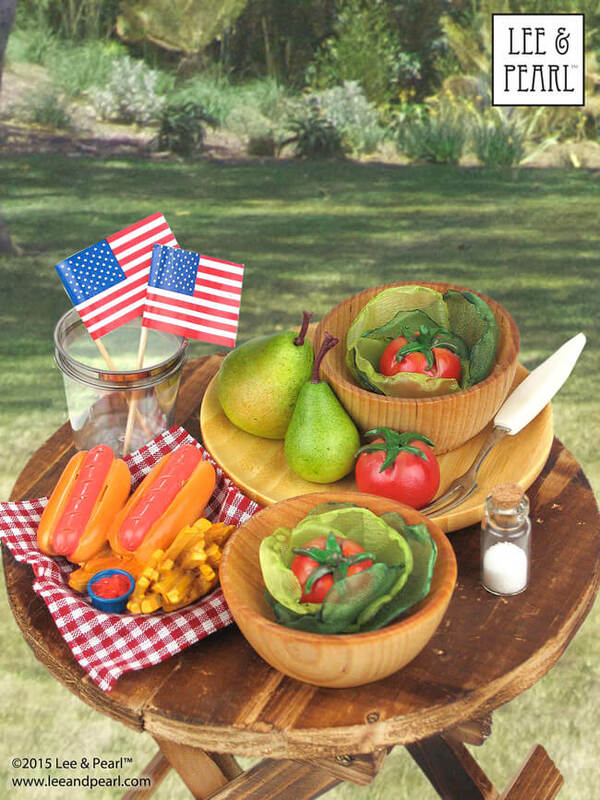 Kit's plastic cups are dollar store shot glasses and the wooden platter and mini salad fork are inexpensive Asian condiment utensils, while the wooden salad bowls are prep bowls, very similar to these from World Market. 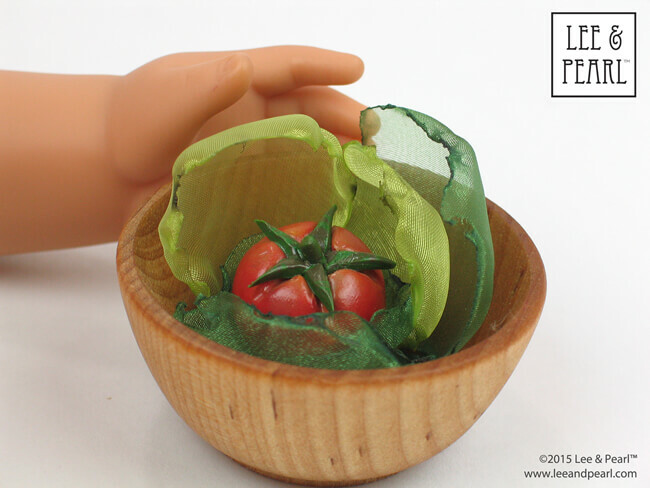 Finally, we made the "lettuce" ourselves from two colors of polyester organza. This is a super easy and fun craft we had to share! Click HERE for the easy organza lettuce tutorial. Hey, look — new staff member Ana (our lovely Truly Me™ #26 from the recent Jill's Steals and Deals sale) and Ivy just arrived, and they brought treats! 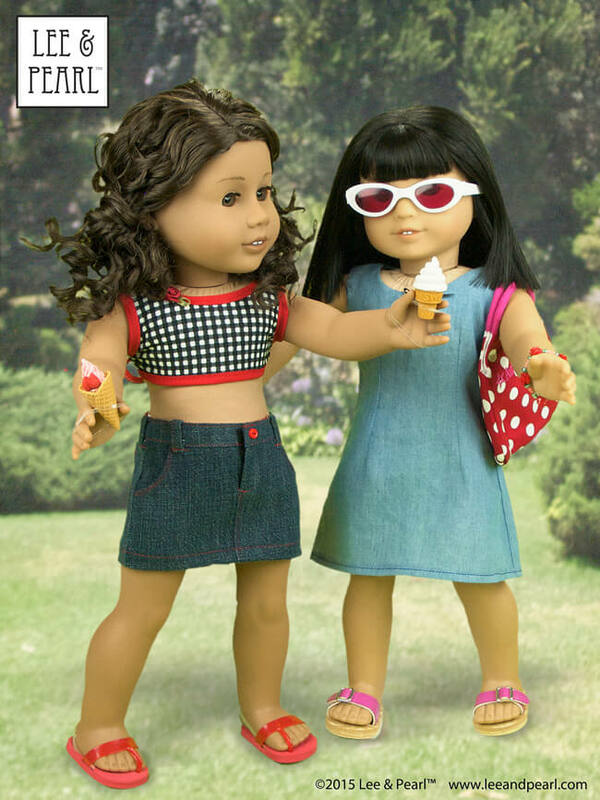 Ana wears a crop top made using Lee & Pearl Pattern #1058: Retro Ruffled Swimsuit and High Waisted Bikini for 18" Dolls and an American classic denim skirt from Lee & Pearl Pattern #1041: Slim Skirts — Denim and Pencil Skirts for 18" Dolls. Ivy looks cool and pretty in a sundress made from the slip pattern in Lee & Pearl Pattern #1943: Molly Waves Goodbye — 1940s Suit for 18" Dolls. The slenderizing darts, French seams and nifty yoke lining make this dress both perfectly fitted outside, and perfectly finished inside. Ana likes her soft serve vanilla cone — a Japanese eraser, available on Amazon or anywhere Iwako erasers are sold. And now Jack's here! Jack is one of our custom American BOY dolls. He started out as a Julie, swapped with a Cécile for Hazel eyes, and got fitted out with a short Monique Bébé wig (size 10/11 in Light Brown). 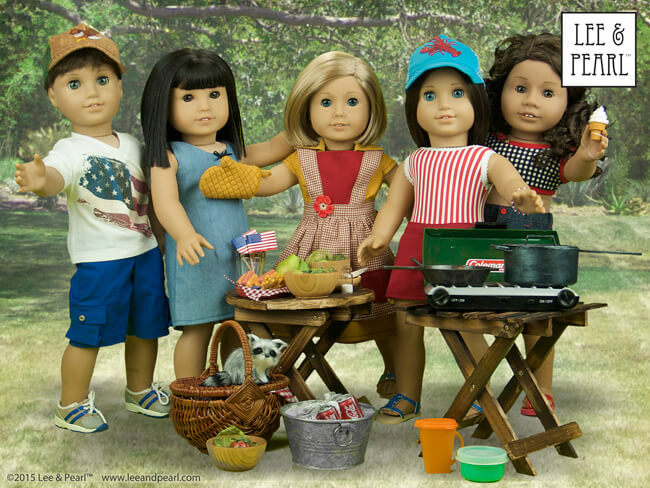 At Lee & Pearl, we are proud of our patterns for girl dolls — and boy dolls! Jack's v-neck t-shirt was made using Lee & Pearl Pattern #1001: Unisex T-Shirts for 18" Dolls and his shorts were made using Lee & Pearl Pattern #1004: "Boy Style" Pants and Cargo Shorts for 18" Dolls. 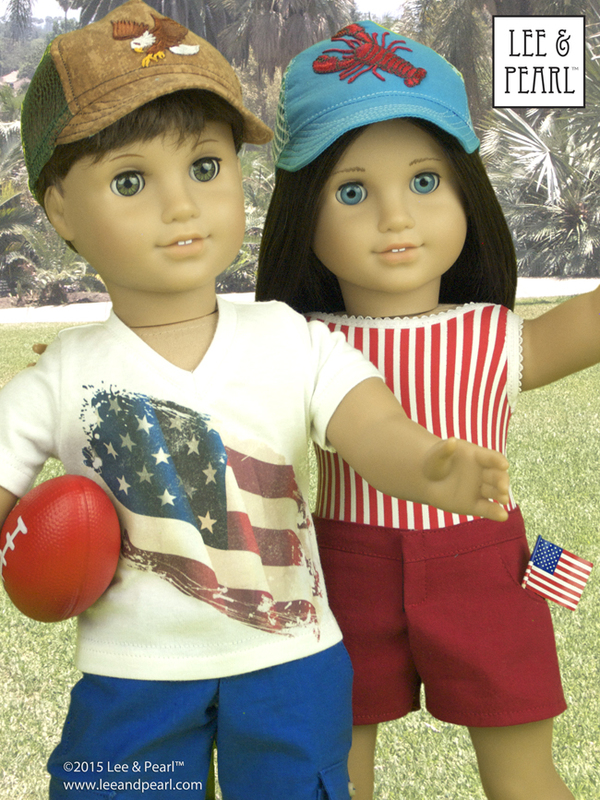 And both Jack and Chrissa wear unique (and easy-to-make) trucker caps from Lee & Pearl Pattern #1008: Classic Ball Cap and Big Fat Trucker Hat for 18" Dolls. We love how that "big fat" front panel leaves plenty of room for fun craft store iron-ons like Jack's eagle and Chrissa's lobster. "C'mon Chrissa — go deep!" Jack and Chrissa work up an appetite playing with a foam stress ball "football." We got ours as a logo-festooned giveaway at a trade show, but we've seen them in craft stores and thrift shops as well. Finally — Molly's here! 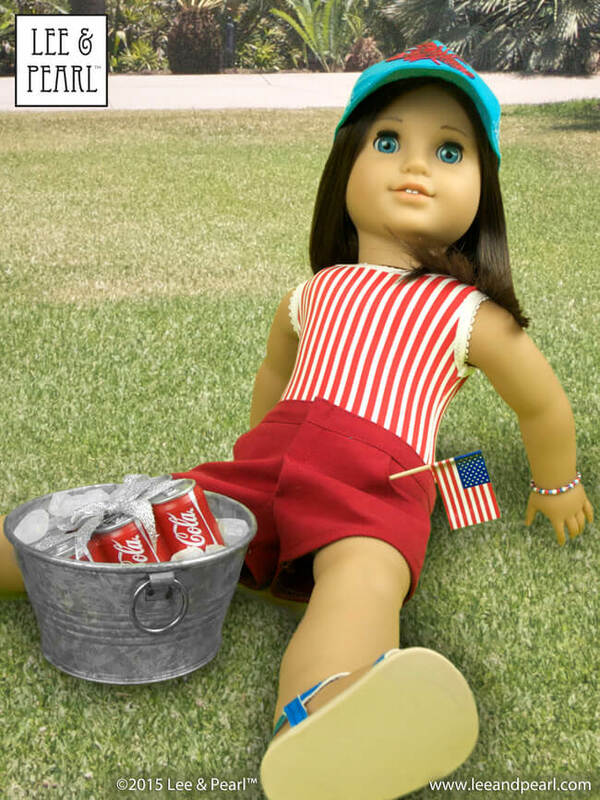 It can't be the Fourth of July without Molly! 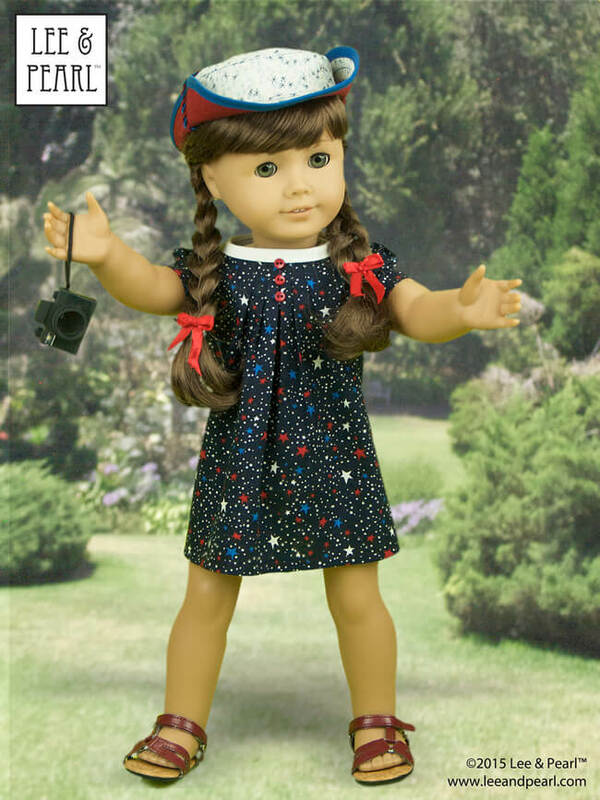 Our spirited Molly looks every inch the patriot in a star-spangled dress made using Lee & Pearl Pattern #1033: Bonjour, Paris Mini Wardrobe for 18" Dolls and a jaunty red-white-and-sunhat made using Lee & Pearl Pattern #1007: Bush Hat or "Boonie" for 18" Dolls. We even followed the bonus directions in Pattern #1007 to make a bi-colored twisted embroidery floss cord to fasten up the brim on Molly's hat. Molly's tiny camera is a Kikkerland LED keychain — a must-have dolly accessory in our book. "Alright, everybody. Scrunch together — it's time to take a picture. Say... Yankee Doodle!" It's time for the big patriotic dance! 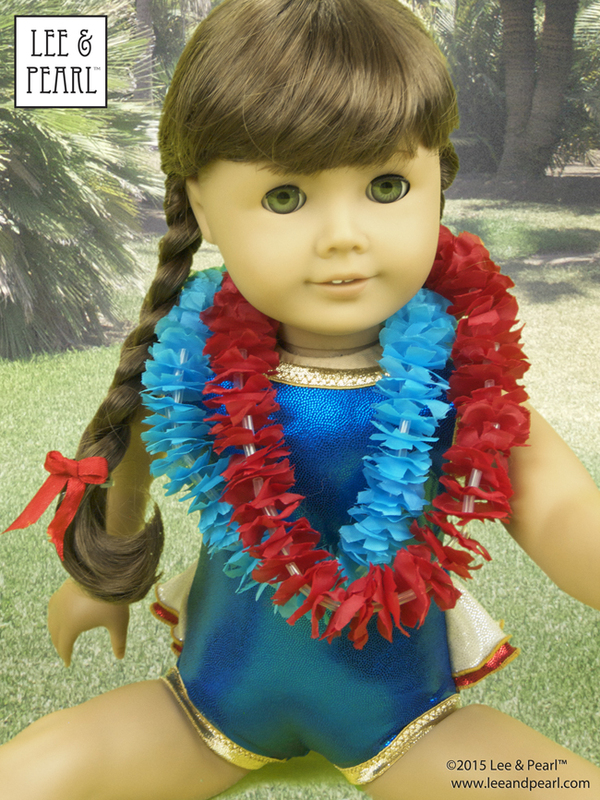 We made Molly this extra-sparkly outfit using Lee & Pearl Pattern #1058: Retro Ruffled Swimsuit and High Waisted Bikini for 18" Dolls, three colors of metallic-dotted "Mystique" spandex-blend fabric and a pair of fabric flower garlands made using our own Hawaiian Lei Tutorial and fabric flower necklaces from Party City. Click HERE for the Party City Fabric Flower Hawaiian Lei Tutorial. 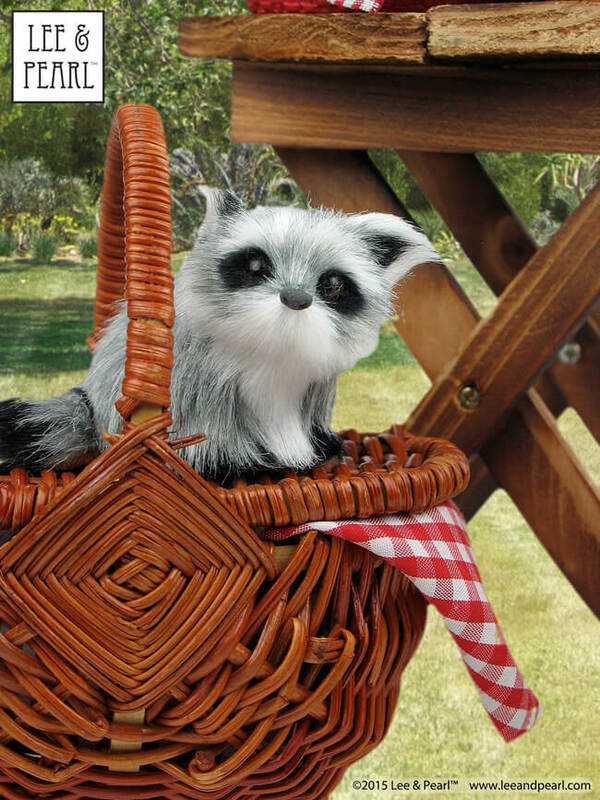 ... even the furry interloper at the picnic: a raccoon Christmas ornament from JoAnn, interrupted during a raid on the covered picnic basket we found at a thrift shop. "TA-DA! This is exactly how I meant to land." Of course it is, Molly. 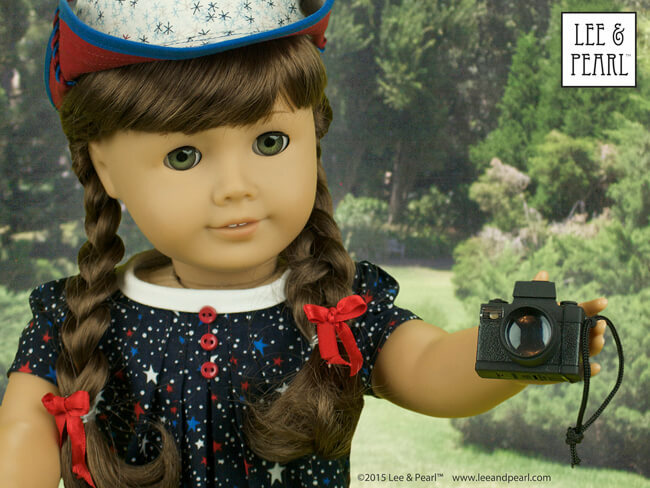 HAPPY FOURTH OF JULY, EVERYONE — from all your friends at Lee & Pearl™! Copyright © 2017 Lee & Pearl. All rights reserved.